There’s something about Olive that keeps drawing Skeeter to the place time and again. The ever-inviting ambience? The pleasant and smiling, unpretentious staff? Aye! But more than that the skilled chef! 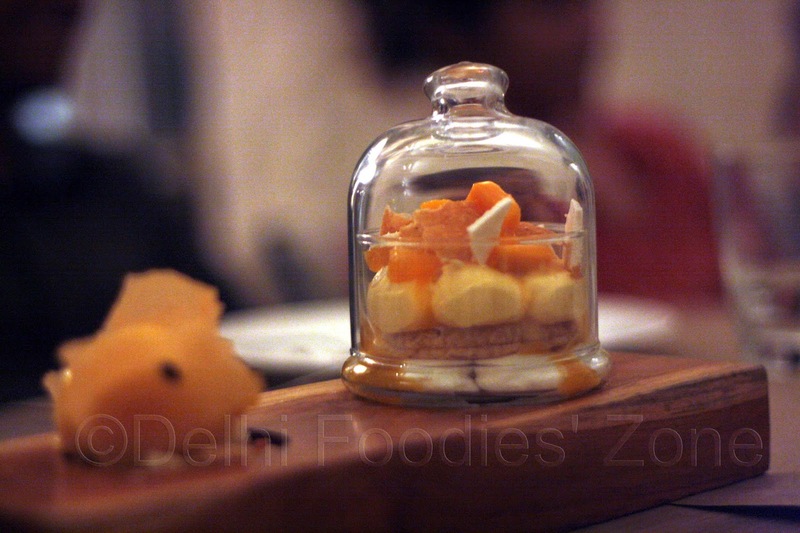 For without good food, a place like Olive at a location like Mehrauli cannot continue to be a crowd puller. Chef Sujan Sarkar bowled Skeeter over with some of his finest creations. 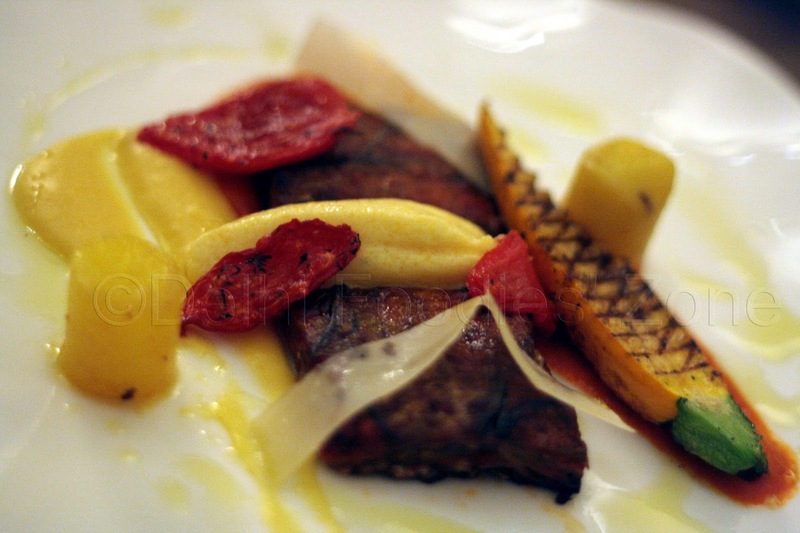 He admits that preparing a vegetarian menu which is neck-to-neck with the non-vegetarian one is no simple task. But he takes up the challenge and how! P.S: Chef Sujan Sarkar is sneakingly suspicious of guests that come asking for Pizzas. Agree Olive pizzas are good, but once you move beyond cheese and tomato there’s a whole new world to discover. Here are Skeeter’s favourites off Olive summer menu. 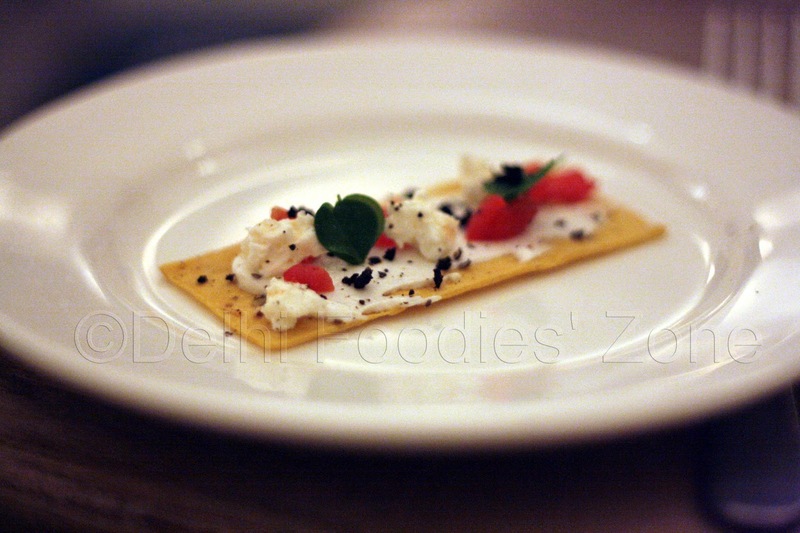 The amuse bouche (above), a pumpkin cracker, slathered with soft goat’s cheese and topped with semi dried tomatoes and garnished with mini sorrel sprouts made for a pretty plate. 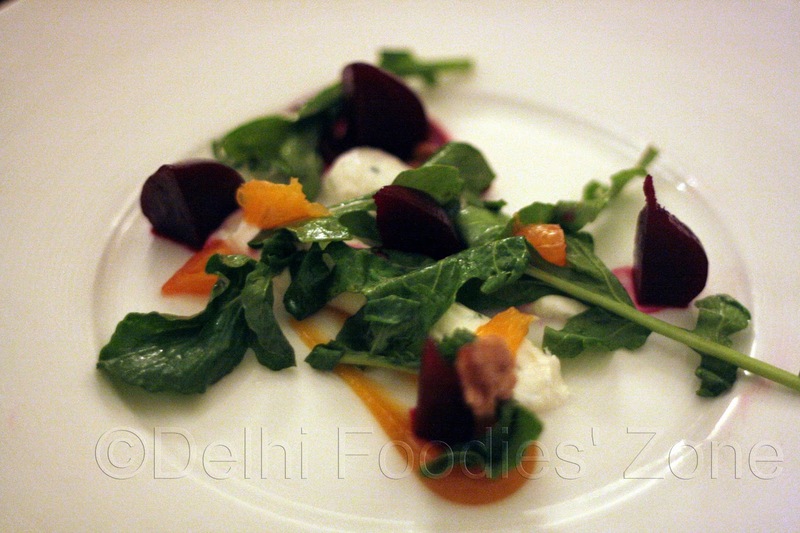 Up next was the Salt baked beetroot with goat’s cheese, wild rocket leaves, orange and apricot puree. The picture below does no justice to the beauty of the plate and marriage of flavours. In India, we are so used to cooking and overcooking our greens (thing what poor sarson ka saag and palak are subjected to: boiling, pureeing and frying! ), that we’ve actually forgotten to keep it simple. Take cue! 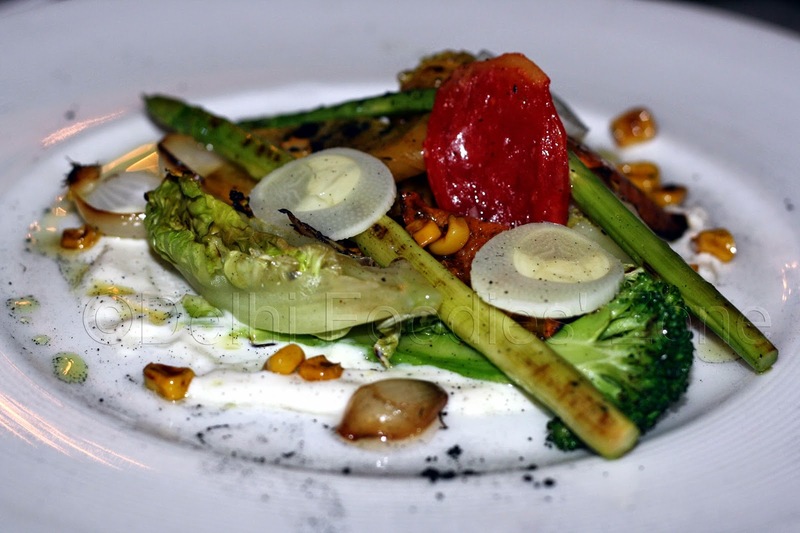 The Charred baby gem and summer vegetables came with savoury granola, smoked goat curd, and pickled palm hearts. Fresh, summery and very indulgent. Skeeter could have had many helpings of the charred baby gem, but then there was other delicious food calling out to her. 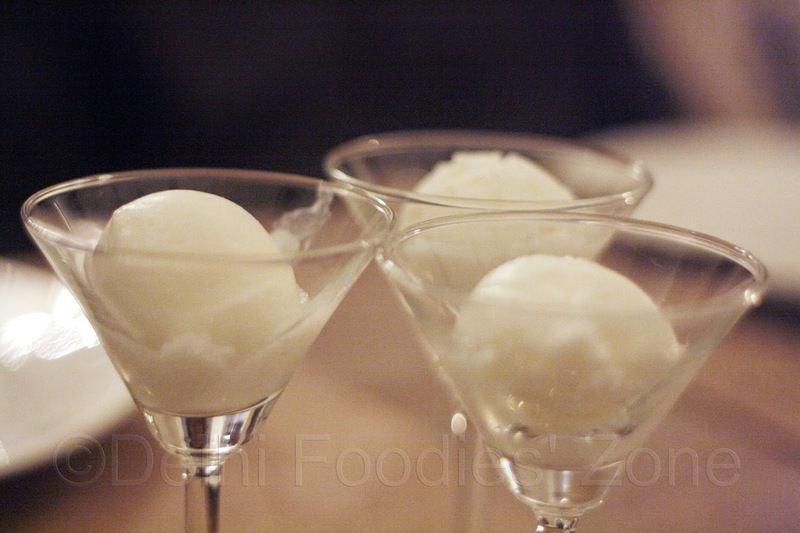 A simple palate cleanser: Yoghurt sorbet (below). On to the mains. 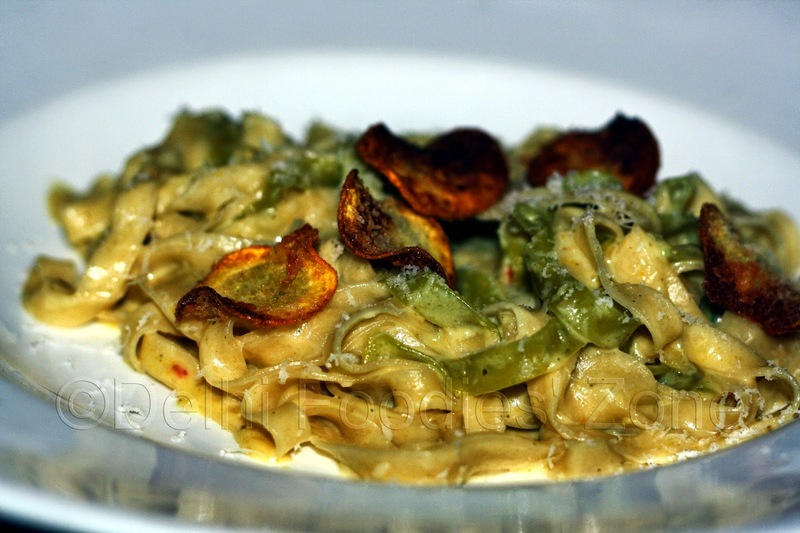 There was Fettucine topped in a simple sauce topped with super crisp Zucchini fritters (pic below). There was a decent Green asparagus and broad bean risotto. But what stole Skeeter’s soul was a wonderfully crisscross grilled baby Zucchini and creamy polenta (Pave of Melanzane). A summer meal is incomplete without king of fruit: mangoes! A Mille Feuille of mango, in signature Olive style (remember the strawberry one? )took care of that. Mango sorbet with a mango and mascarpone cheese mousse. Yum! And though there was no, and absolutely no space for more, the chef insisted we wait for the baked cheesecake, which was a 5-star dessert! 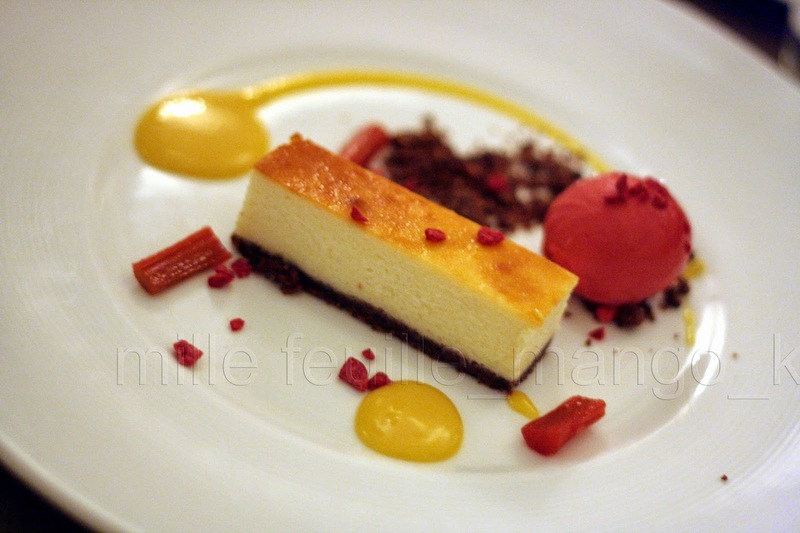 It came with passion fruit curd, some rhubarb bits for decor, chocolate soil and sorbet on the side. Divine!